Blue is a gorgeous, ready-to cruise 2006 Antares. 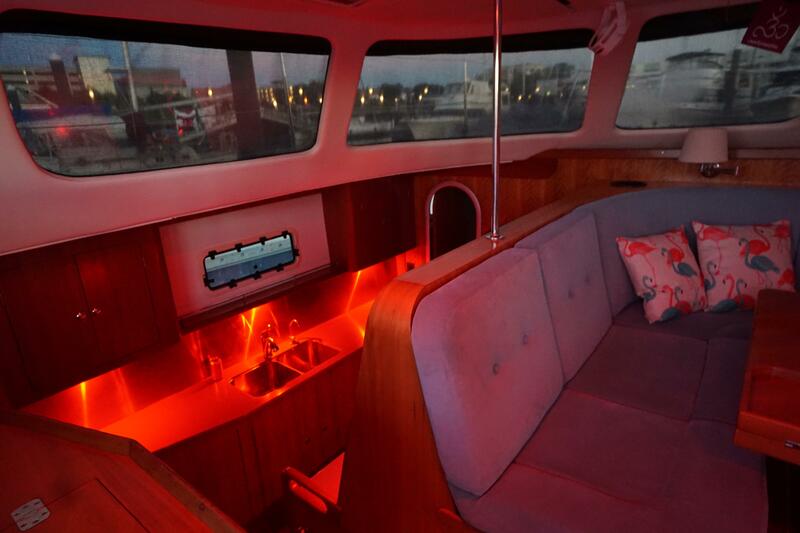 She is outfitted with all the equipment, upgrades and luxuries to set sail on your dream trip, whether it ranges from circumnavigation to coastal excursions. Blue has many upgrades that you won’t want to miss. 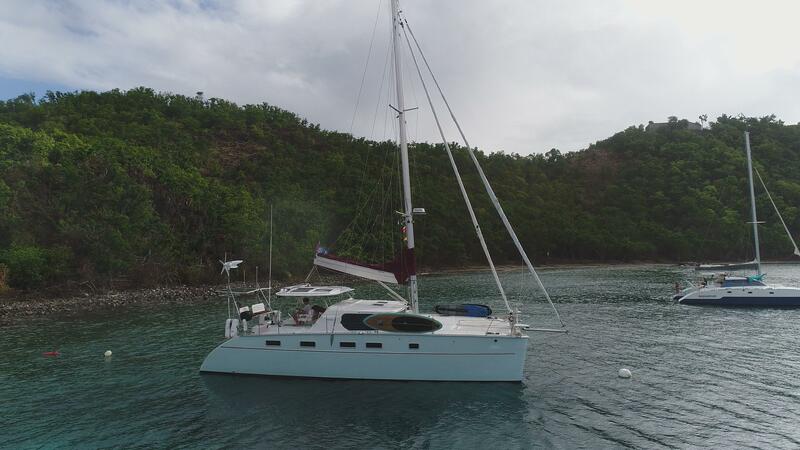 This is the best catamaran out there to experience amazing sails and sunsets wherever the wind may take you. Blue will be moving to Stuart, FL in November. Blue’s salon is beautifully laid out. 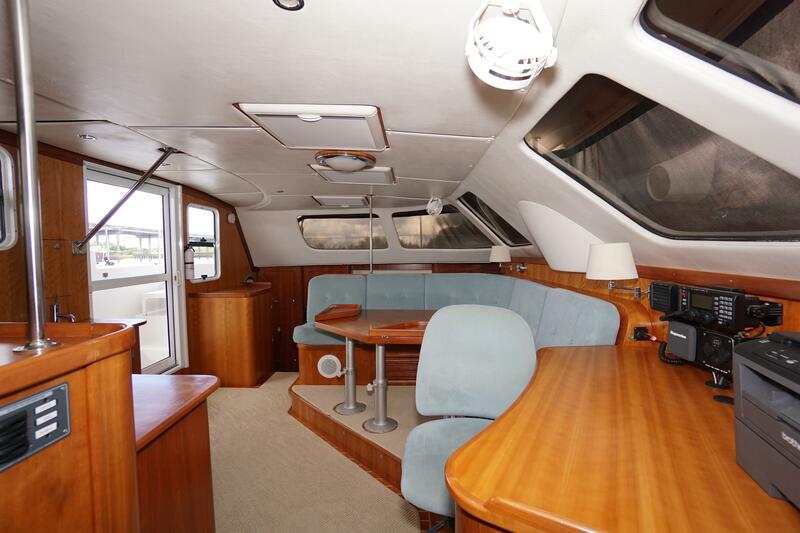 With its cherry wood throughout and vast windows, the space is open and very welcoming. The settee is L-shaped and center in the salon. It is elevated on a platform for increased visibility and provides storage underneath. The table is designed to drop down to coffee table height or raise for dining. There are folding corners that allow the table to be larger or smaller depending on the crowd. 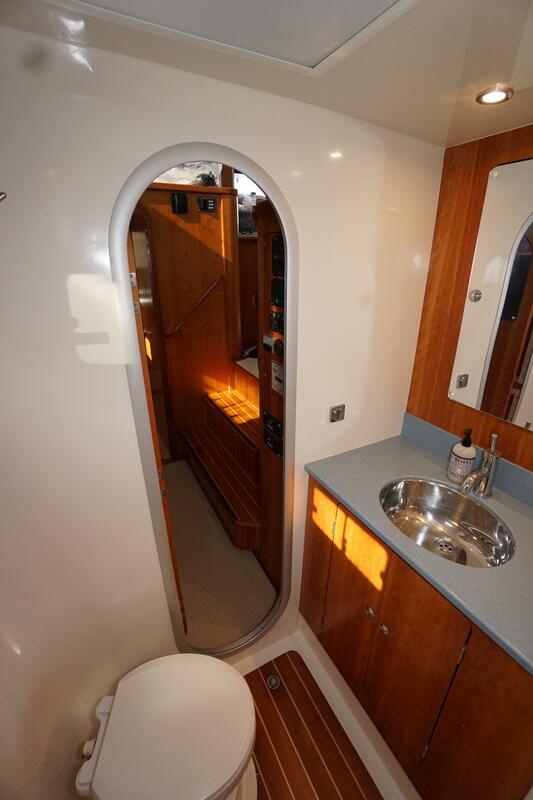 There is an entertainment/storage unit on the aft salon wall. 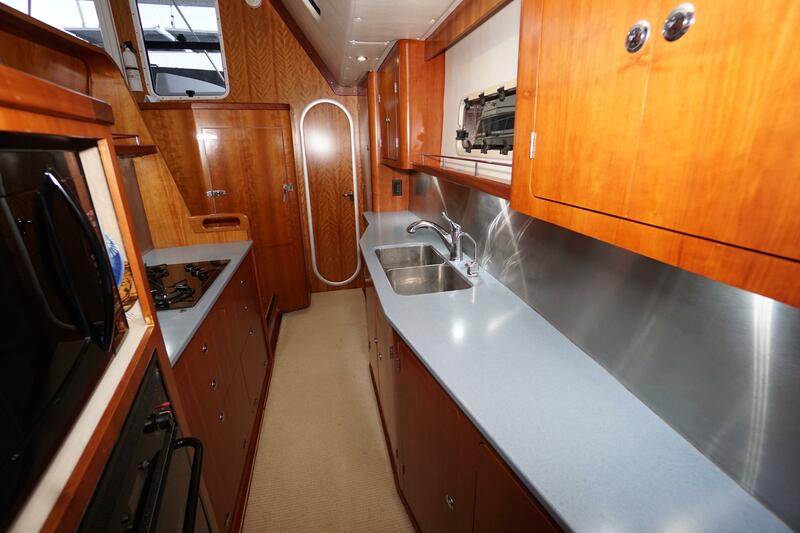 It is 19" deep has 2 cupboards and 2 drawers. There is additional storage for entertainment equipment and guide books. 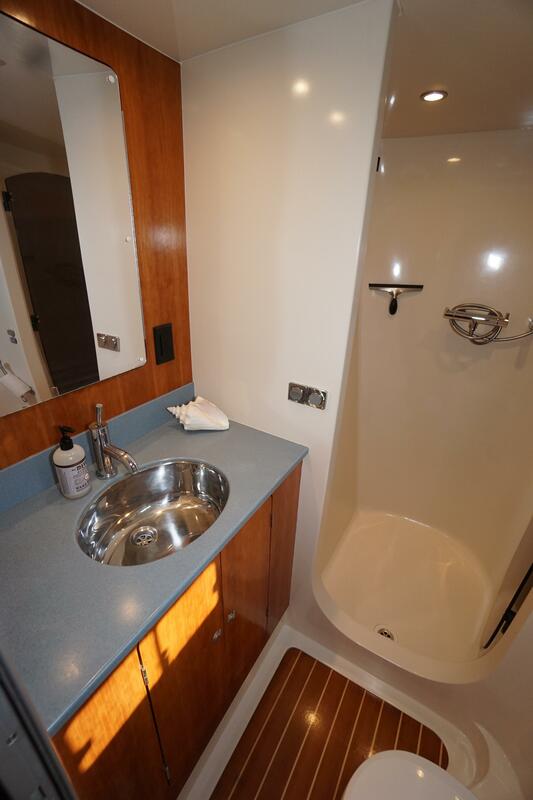 On the port side, aft of the galley is the 1st guest cabin. 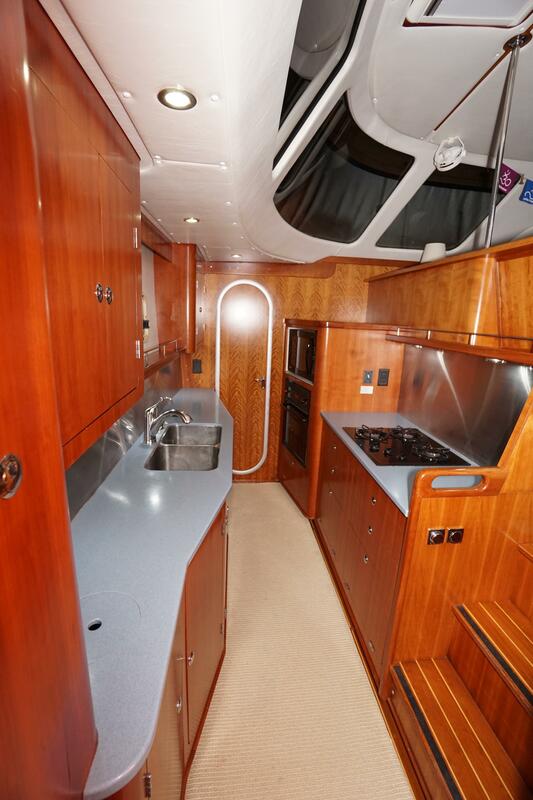 Laid out similar to the master, it also boasts a true queen sized bed and many storage cabinets. 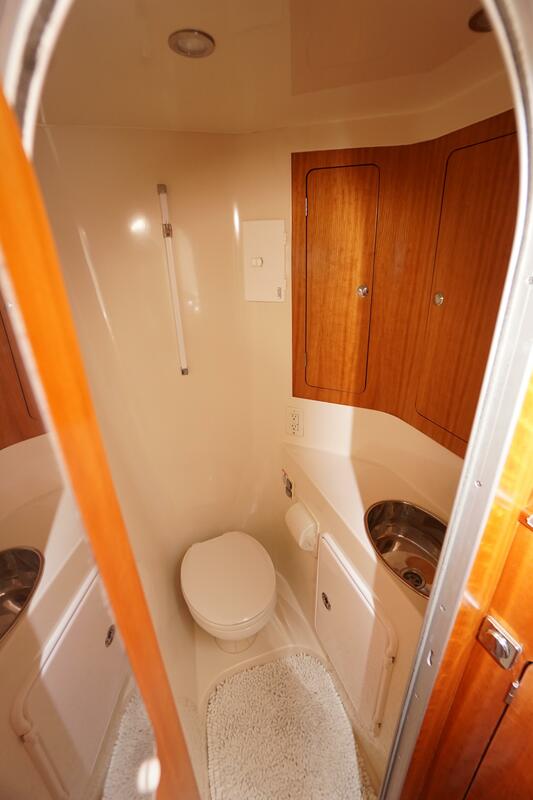 It also has a very large storage area under the berth. Two hatches; one with Oceanair blind and another with screen. 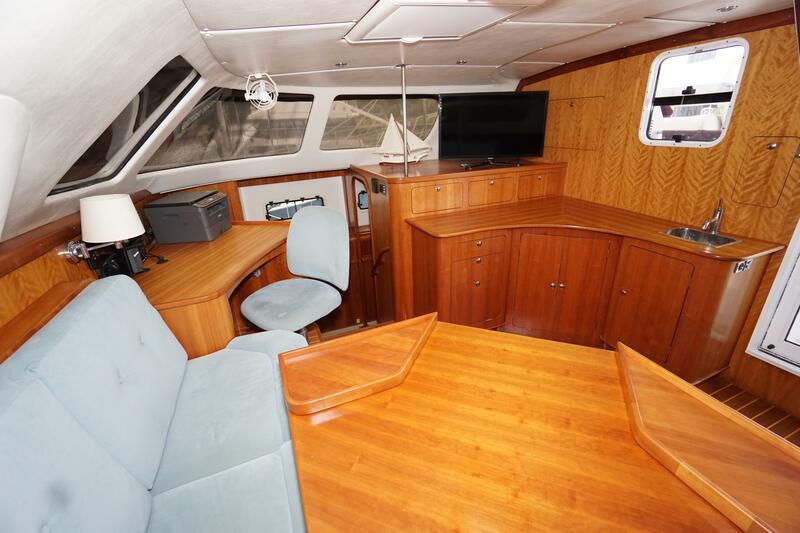 The 3rd guest stateroom is forward of the galley on the port side. 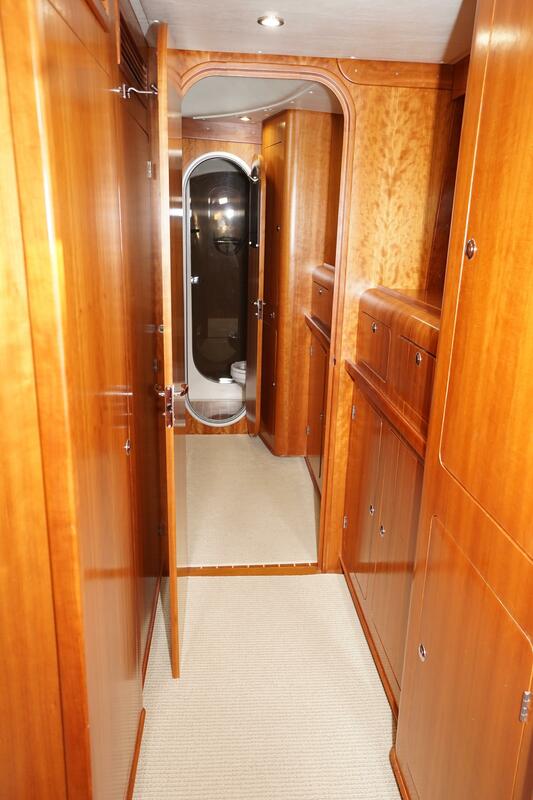 There is a double berth and massive storage compartments below. 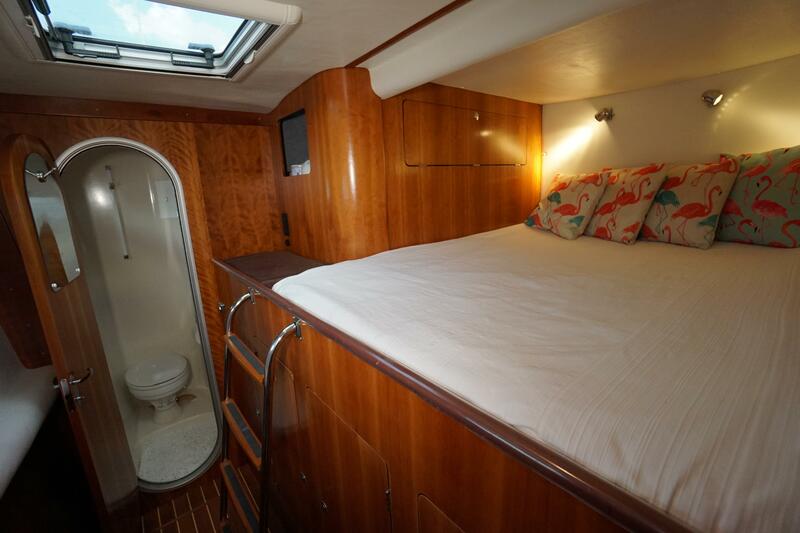 There is also storage beneath the mattress and on the side of the bed as well. Blue has a second head located forward on the port side. All lighting has been converted to LED in fall of 2017. 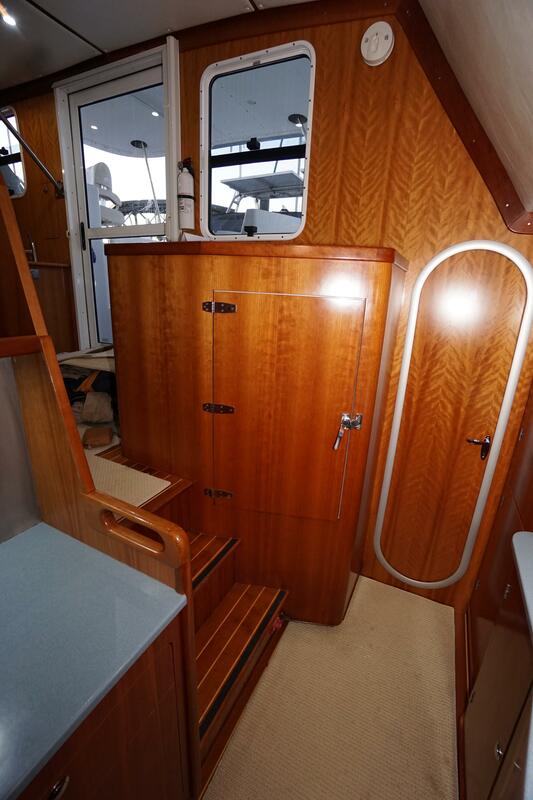 The forward locker on the port side houses the generator and a large area for storage. Steps lead down into the vast 6' headroom space. 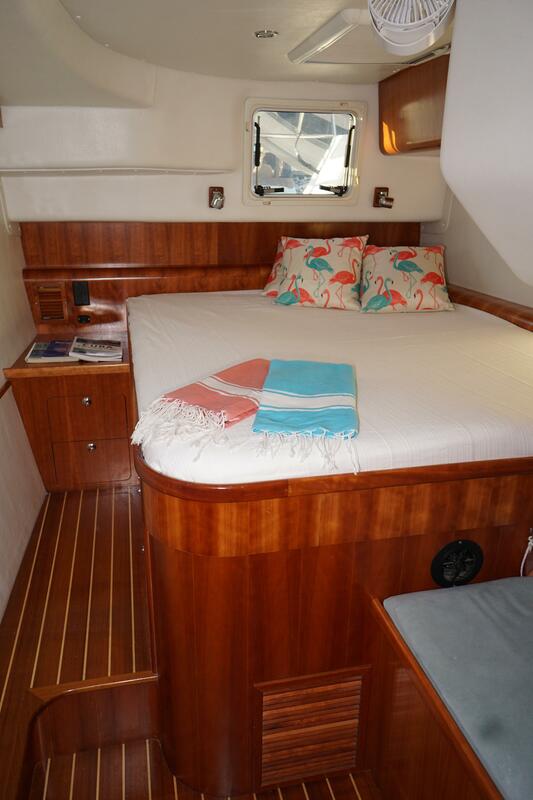 Mainsail - 60 sq meters - by Quantum in Cruising Dacron (10/17). Single line reefing for 2 reef points. Blocks attached to the mainsail to prevent chafe when reefed. 95% Jib – 23 meters sq - Factory original - rarely used. 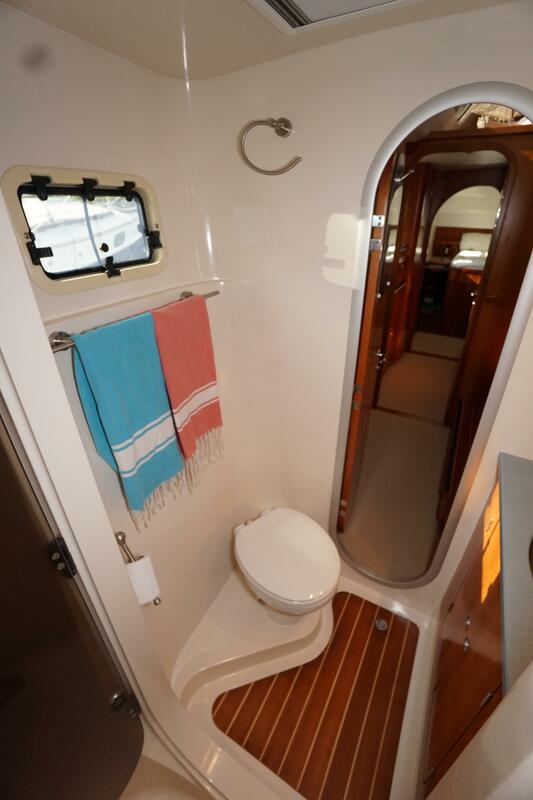 150% Genoa – 42 meters sq - by Quantum in Cruising Dacron - new 10/17. Harken self tailing 2 speed 44 winches. Code Zero -80 sq meters - by Quantum in CZ high strength Tri radial with Dacron UV Cover - New 10/17. Code 0 sheets lead aft via fairleads. Heavy Duty loops used to attach the upgraded blocks to the stern cleats. 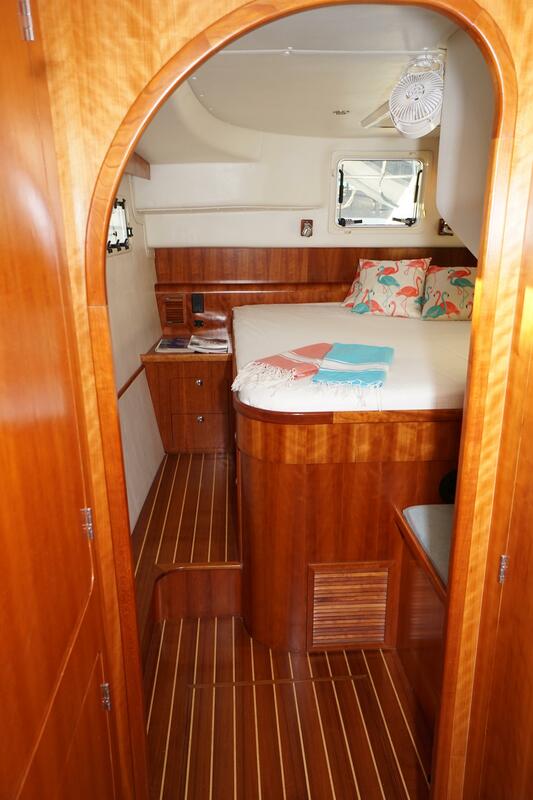 Screecher -60 sq meters - by Mack Sails in Polyester- New 2012. Spares kit which includes injector, fuel pumps, filters, gaskets, impellers, water pump, fuel filter housing and filter spares, Raycor filters, etc. Battery Monitor: Xantrex house battery monitor. 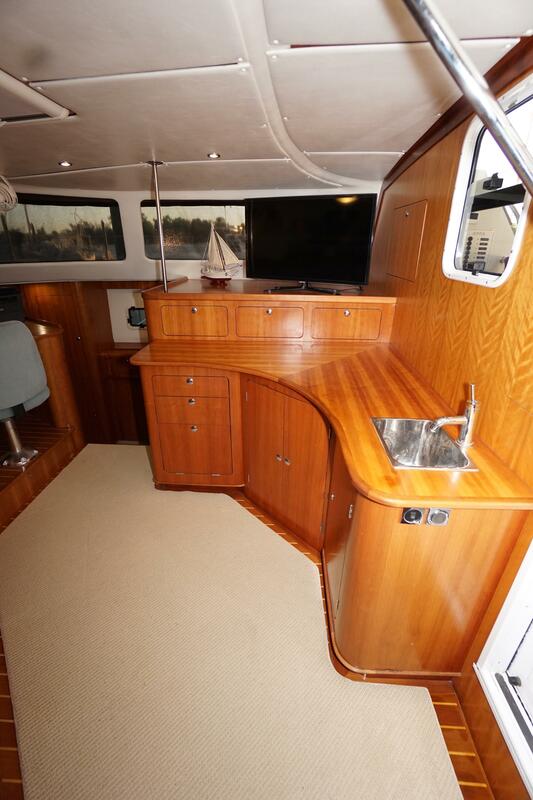 Shore Power: 2 stainless steel 30 amp inlets mounted on starboard side. Two Siemans 30 amp heavy duty breakers mounted close to shore power inlets. Two 50 ft 30amp power cords with 50 amp splitter. 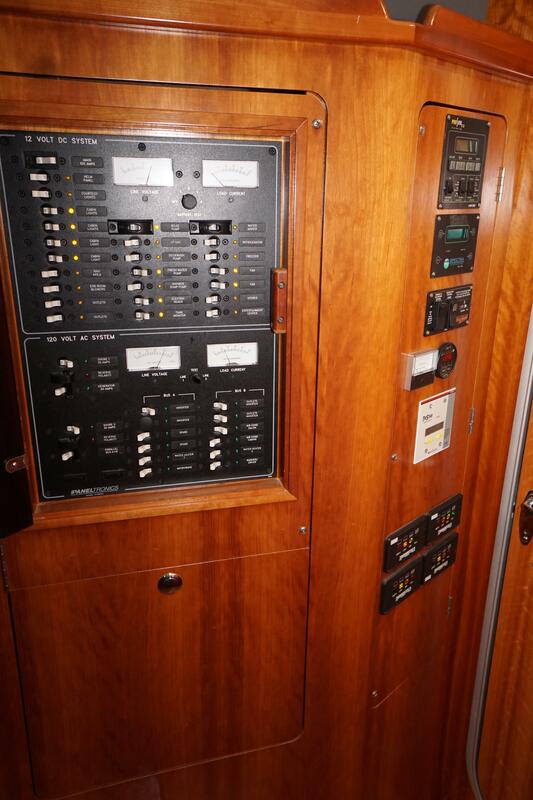 12VDC: Paneltronics 24 5-15 amp breakers with a 100amp main switch. Digital Voltmeter for reading all batteries, and an analog meter for reading load current. Additional 10 breaker Paneltronics panel at the Helm Station. 110VAC: Paneltronics 11 breakers. Additional safety breakers either connect shore power or generator, not both. Can parallel the input such that only one shore power connection will work should you only want to hook up with a single 30 amp rather than 2 X 30 amp. 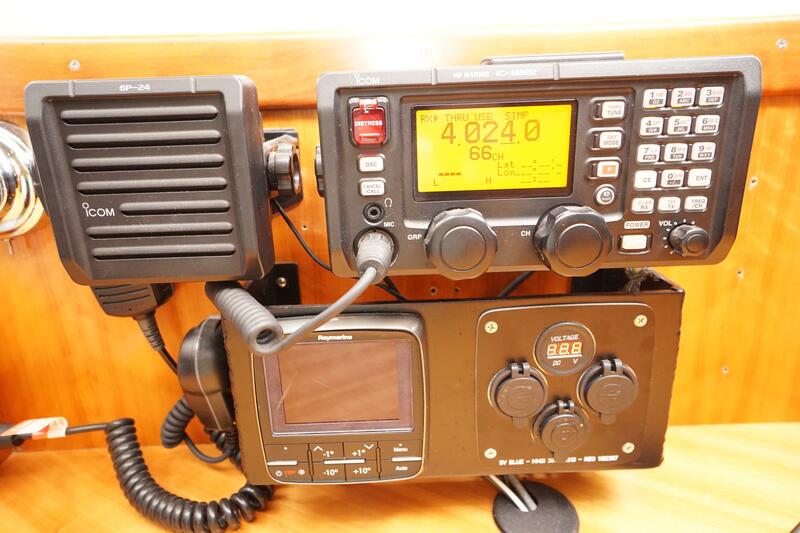 ICOM IC-M802 HF Marine SSB/Ham radio with external speaker and Auto Tuner at Nav Station. Dynaplate and copper mesh grounding. SSB antenna mounted on Port transom. Shakespeare AM/FM - VHF Band separator on VHF antenna wired directed to entertainment area. Spinlock Line clutches. 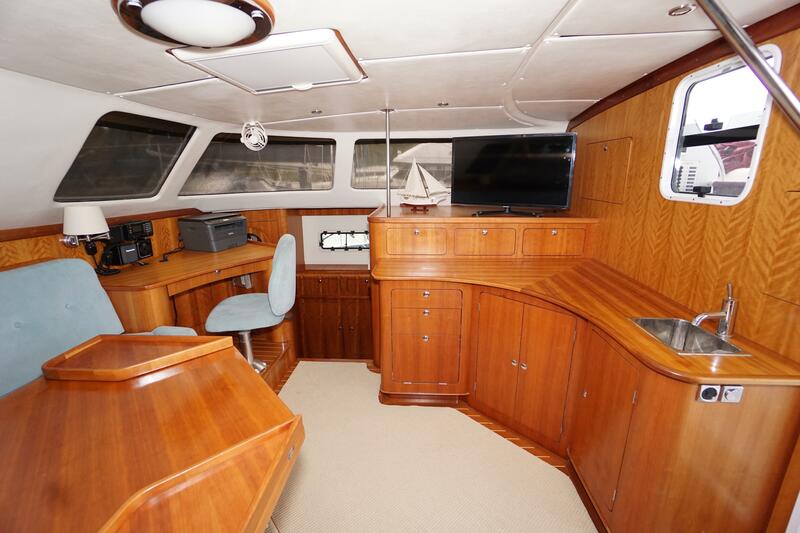 There are 6 at the aft winch, 4 at the forward winch, and one on the bowsprit. 2 Mooring cleats (12”) with one fairlead amid ships on each hull. Recessed Swim ladder mounted on port side steps. Easily deployed from in the water. Stainless steel through-bolted chain plates into primary reinforcements. Aluminum compression member that supports the forestay, wire bridle and tie-down for the trampoline. Net is woven and sewn Vinyl-dipped Dacron material for excellent comfort and durability. Stainless steel arch with integrated bench davit system. 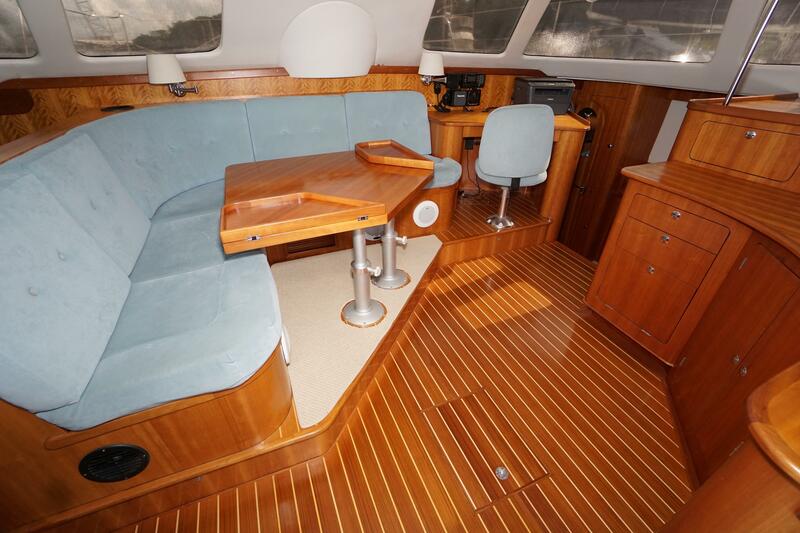 Elevated bench seat is 4 person constructed of Starboard. Davit system is suitable for dinghies up to 12 ft in length. Upgraded the lifting blocks. 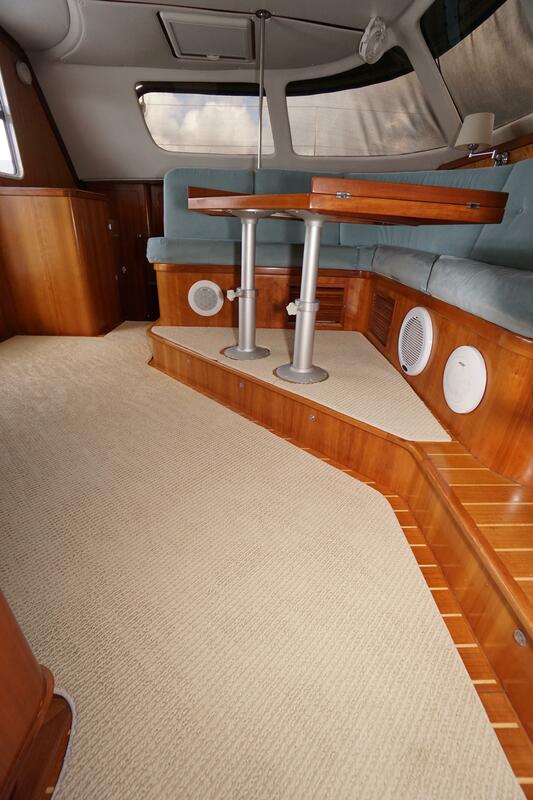 FRP bimini hardtop includes intrgral carbon fiber beam support for Harken traveler. 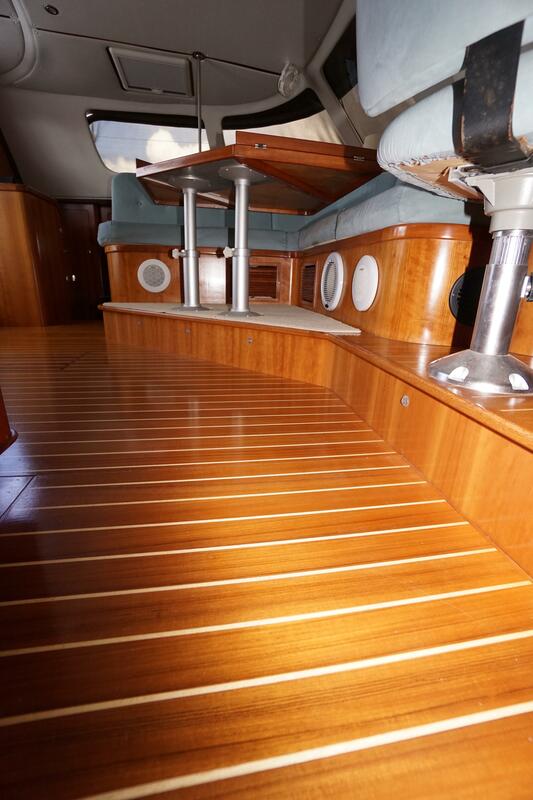 Stainless steel step to bimini top. Double helm seat with reversible back rest. Sunbrella cockpit upholstery in Burgandy. Burgundy Sunbrella sunshade between hardtop and davits with vertical white sunscreens hanging behind rear bench. All line clutches for halyards, reefing, lines, sheets, boom brake, furling, and topping lift led aft to two winch stations. 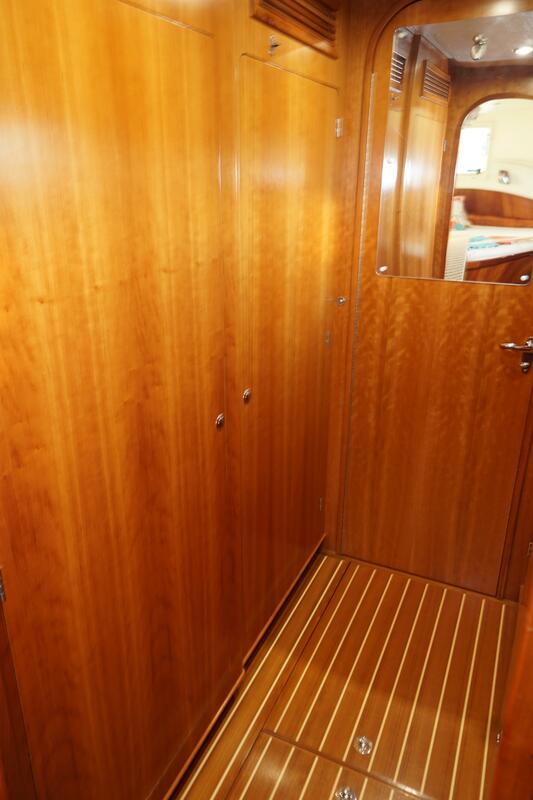 Port forward locker with access to sail storage. Bomar hatch. 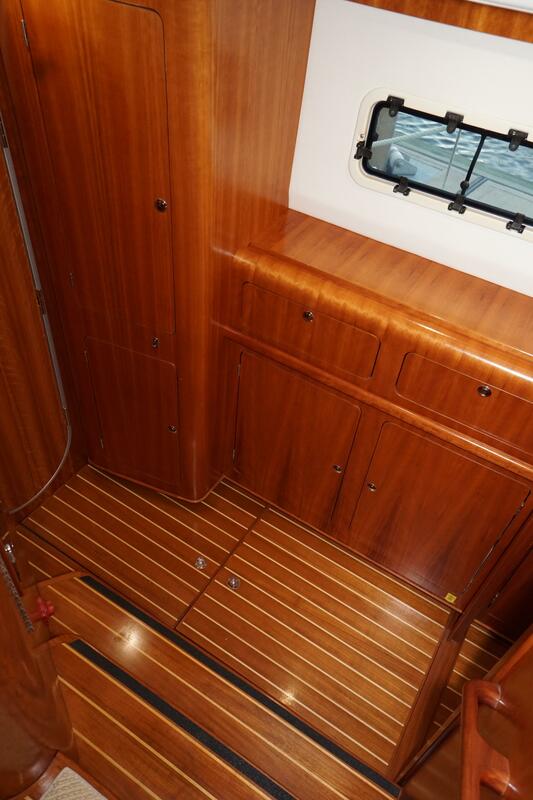 Starboard forward locker with steps attached to outboard wall provide generator access. Bomar hatch. 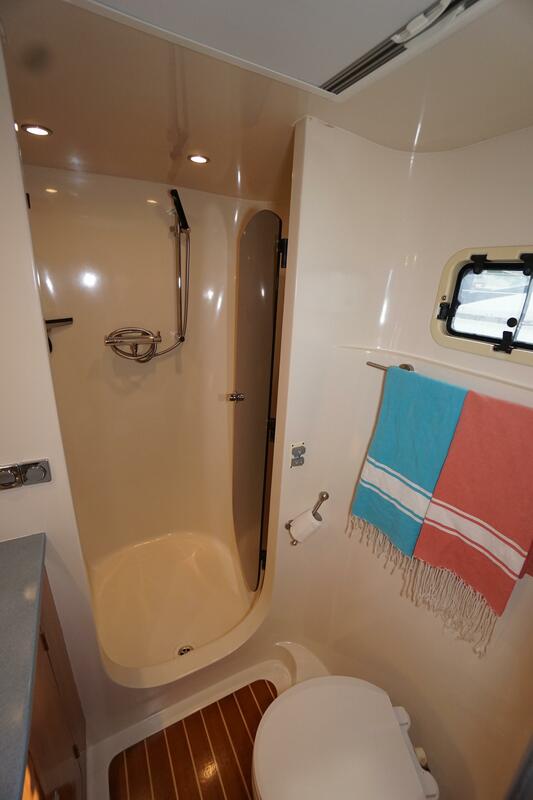 Transom lockers with access to shaft steering system, water maker, etc. House water system is pressurized by a Jabsco Sensor - Max VSD water pump, flow rate 4.5 gal/min. 0.5 micron drinking water at galley sink. Spare filters. Ability to designate draw from either port/starboard tank. 30 gallon holding tank is located adjacent to the head(s). A "Y" valve is installed to select deck or overboard discharge. Configured so that it can be secured in the closed position. 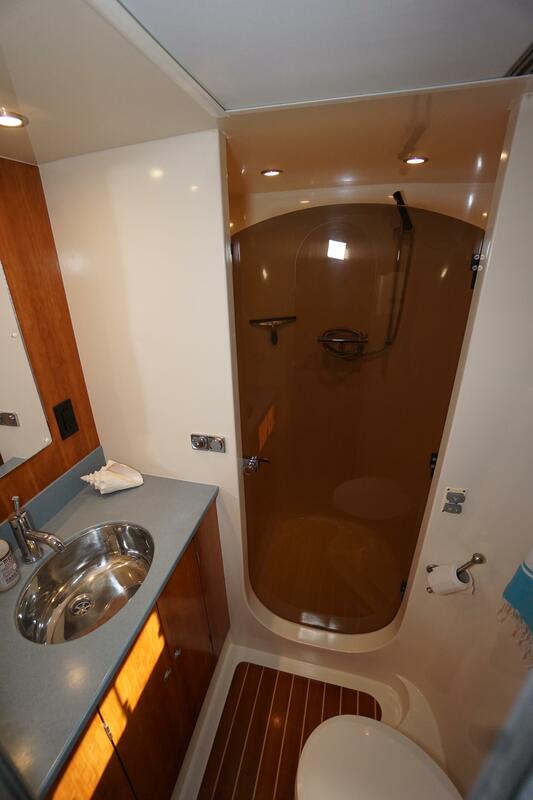 Rule 1500-gph bilge pump installed amidships in each hull. 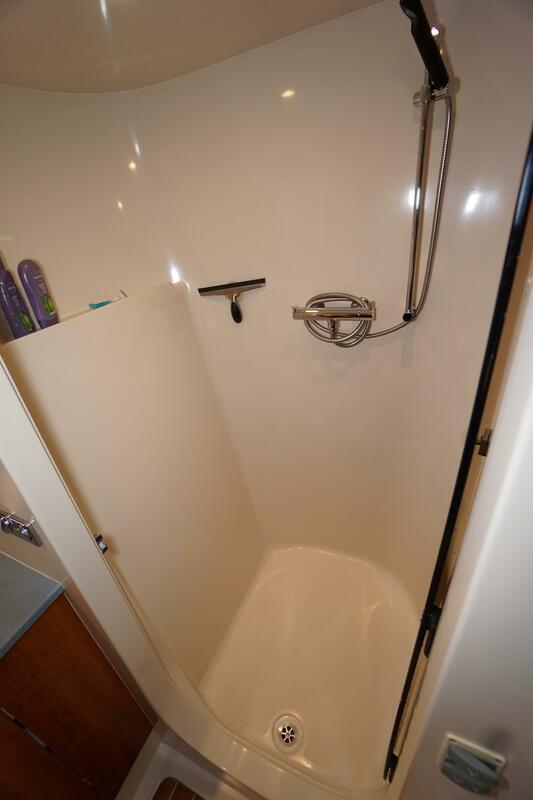 Fresh water hot & cold hand held shower is located adjacent to port transom stairs. 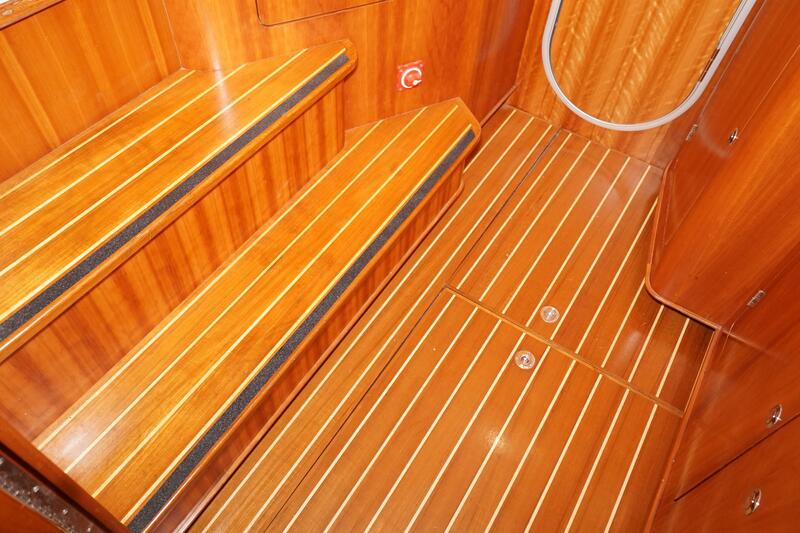 Salt water wash down located in the anchor locker. Flexible hose attached. Pump mounted in the port hull. 10' 5" AB Double bottom inflatable (2007). Two way inflation hand pump. Appropriately mounted U bolts to secure dinghy on davits.